A new 3D map shows that our galaxy isn't nearly as tidy as we thought. It turns out that Milky Way galaxy looks different from the familiar image we’ve all come to know. Our galaxy still has a bright central core around which a spiraling disk orbits, but that disk isn’t quite as tidy as scientists previously thought. Instead, it’s bent and warped out of shape, according to a new 3D map of the galaxy described in research published Monday in the journal Nature Astronomy. The new map suggests that there’s a lot we don’t know about the universe, and that we can expect to keep updating our knowledge about even the parts of the cosmos closest to us. The new map was built from a survey of 1,339 stars called “classical Cepheids.” Often, attempts to plot stars’ location in the cosmos are stymied by misleading measurements. Sometimes astronomers will conclude that a particularly-bright star is closer to us than it actually, is or that dimly-lit stars must be far away. But the rhythmic pulsations of light given off by Cepheids allow astronomers to determine precisely how far away they are just by measuring their brightness, according to Astronomy. 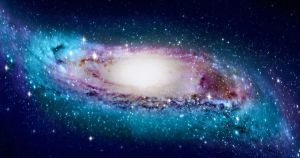 Using data from WISE, a NASA program seeking to survey the entire sky in infrared, the team of Chinese and Australian astronomers observed that the locations of these classical Cepheids suggest a very different galactic structure than we’re used to. The researchers didn’t investigate why the galaxy looks the way it does, but they did fathom a guess. A typical model of a spiral galaxy like ours, whether it’s in the latest NASA simulation or a sci-fi movie, generally shows a gigantic central mass around which long, spiraling arms gently orbit. But the astronomers behind this new paper suggest that the various interconnected pieces of the galaxy have a more complex relationship than that — as the galaxy’s central core spins on its axis, it may be dragging against the outer disks and pulling them out of shape. Whatever the reason, it’s clear that we don’t as much about our cosmic home turf as we once thought.